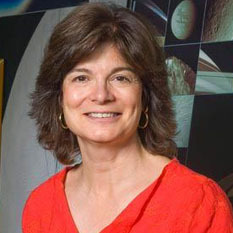 Dr. Carolyn Porco is the leader of the Cassini Imaging Science team and the Director of the Cassini Imaging Central Laboratory for Operations (CICLOPS) at the Space Science Institute in Boulder, Colorado. She is also an Adjunct Professor in the Department of Astrophysical and Planetary Sciences at the University of Colorado in Boulder. Her specialty is the study of planetary ring and moon interactions, and the study of the geysers on Enceladus.